The Glenlivet, the world’s No 2 single malt Scotch whisky, is releasing the latest addition to its acclaimed Cellar Collection range of limited and unique vintage batches – The Glenlivet Cellar Collection 1980. The 1980 expression is drawn from three first-fill American oak casks that were singled out as exceptional. They completed their maturation in The Glenlivet’s celebrated warehouse No 1 and have now produced a single malt worthy of a Cellar Collection release. 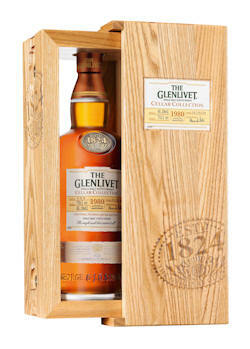 The Glenlivet Cellar Collection 1980 is the ninth release from the award-winning range. Just 500 bottles of this non chill-filtered, cask strength single malt whisky will be available in markets including Taiwan, Japan, Travel Retail and Portugal, and priced from £1000 for a 70cl bottle. Presented in individually numbered bottles, this latest masterpiece was bottled in August 2011 with a 43.3% ABV. Perfectly balanced, the whisky is bursting with fruity aromas of blackcurrant and pear along with soft peppermint, developed over many years of careful maturation. Introduced in 2000, The Glenlivet Cellar Collection showcases some of the most remarkable expressions of The Glenlivet, selected from rare aged stocks within the distillery and laid down for further maturation and eventual release. Each bottling exhibits the distinctive personality of The Glenlivet whilst displaying its own unique characteristics.